The singer has said he plans to keep writing and recording. 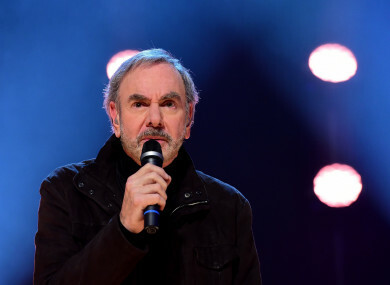 NEIL DIAMOND HAS announced he will immediately retire from touring, after being diagnosed with Parkinson’s disease. Following his doctor’s advice the singer, who turns 77 tomorrow, scrapped Australia and New Zealand dates scheduled for March as part of a global tour to celebrate his 50th anniversary as a recording artist. However, Diamond said in a statement that he plans to “remain active in writing, recording and other projects for a long time to come”. “It is with great reluctance and disappointment that I announce my retirement from concert touring. I have been so honoured to bring my shows to the public for the past 50 years,” the singer said, apologising to his fans who had been anticipating the upcoming shows. This ride has been ‘so good, so good, so good’ thanks to you. Diamond, who dropped out of New York University to start a career writing songs for stars such as The Monkees, found fame on his own by the late 1960s after emerging from the folk scene. As tastes shifted to louder and more provocative rock, Diamond won a fan base by going into softer fare that harked back to classic pop. The old-style crooner packed concerts with hits including Sweet Caroline, Girl You’ll Be a Woman Soon and Cracklin’ Rosie. An inductee into the Rock and Roll Hall of Fame, Diamond will be honoured again this Sunday with a lifetime achievement award at the Grammys. Diamond recently appeared on New Year’s Eve in New York’s Times Square to lead the packed crowd in a singalong of Sweet Caroline. In a 2014 interview with AFP, Diamond said he tried not to be influenced by whatever was popular on the radio — and that he could not imagine ever retiring. “I think it would be horrid for me, stopping would be very difficult,” Diamond said. It’s part of who I am. Diamond had already performed 55 shows on his 50th anniversary tour, filling arenas across North America and Europe. He played Dublin’s 3Arena back in October – with the Hot Press reviewer observing “Make no mistake; Neil Diamond’s still got it”. The rafters shook with “excitable screams” as the New Yorker strode onto the stage, the review said. Parkinson’s disease is a chronic, degenerative neurological disorder that affects the body’s motor system, often causing shaking and other difficulties in movement. The disease, which mostly commonly affects older people, is not fatal in itself but can become debilitating. Email “Neil Diamond is retiring from touring after being diagnosed with Parkinson's ”. Feedback on “Neil Diamond is retiring from touring after being diagnosed with Parkinson's ”.